After signing a business partnership way back in February 2017, Toyota and Suzuki have finally announced some specific details about their collaboration, ranging from joint EV development to mutual sharing of vehicle platforms and production facilities. Japanese carmakers Suzuki and Toyota, in addition to bringing together Toyota’s strength in electrification technologies and Suzuki’s strength in technologies for compact vehicles, have announced that they wish to expand the scope of their collaboration by venturing into popularisation of electrified vehicles and mutual sharing of vehicle platforms for production. In a detailed release, both the companies have listed out their forthcoming contributions to the collaboration while also listing out their India-specific plans. 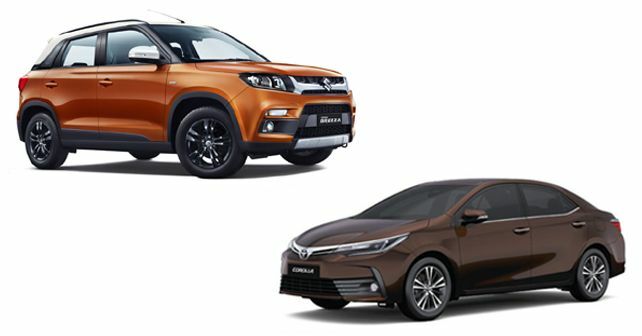 While we were already made aware about models like the Brezza, Baleno and the Corolla Altis being considered for cross-badging, the current release also mentions sharing of the Ciaz and Ertiga in the African markets while Toyota borrowing the Ertiga's underpinnings to develop a new C-segment MPV. Apart from sharing models and platforms, the collaboration also involves mutual OEM supply and sharing/development of Hybrid Electric Vehicle (HEV) technology. In a nutshell, Toyota's main role in India will be to share its HEV tech with Maruti Suzuki which will be boosted via local procurement of parts. In Europe, Toyota will be responsible for supplying two EVs to Suzuki which will be based on the RAV4 and the Corolla Wagon. Further, Toyota will also supply its hybrid systems to Suzuki for global use. In exchange, Maruti Suzuki will supply two compact vehicles to Toyota which will be built on the platforms of the Ciaz and the Ertiga while for the African market, Suzuki will manage the OEM supply of the Baleno, Ciaz, Ertiga and the Vitara Brezza to Toyota. In terms of powertrain development, Toyota will adopt new Suzuki engines in Europe, which will be manufactured at its facility in Poland.